DC Mayor Vincent Gray has unveiled a new budget which proposes to increase photo enforcement revenues by $30million to help close the city's looming budget gap, according to an article in the Washington Post. The fines will be a part of a new "traffic calming initiative" which includes not just speed cameras, but also red light cameras which ticket motorists for coming to a full stop slightly past the white line, making right turns, "blocking the box". The city also uses parking ticket cameras attached to street sweepers. DC has frequently been criticized for using its photo enforcement program as a de-facto commuter tax, largely targeting Maryland and Virginia residents. A recent proposal to lower most speed limits in the city to 15mph was abandoned after it was shouted down by the press. 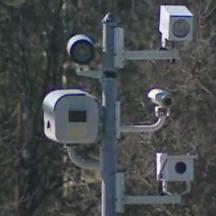 earned approximately $50million in speed and red light camera tickets in FY11 alone. Mayor Gray's administration has recently been the target of a federal investigation into improper campaign financing.